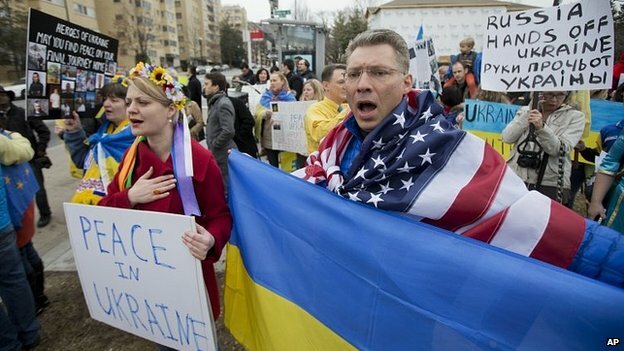 The world has been watching Ukraine’s crisis that has been going on since Autumn of 2013. If you haven’t been keeping up with the news, Ukrainians have debated whether their country should agree to join the European Union (also known as E.U) or continue to hold strong ties with Russia. The country has been literally split in half. The western part of the country mainly supports the idea of merging with the E.U. Their explanations are that joining with the E.U promotes free movement of people, goods, and services. If under the E.U., Ukraine would operate as a state of a country rather than an actual country. The eastern part of Ukraine mainly supports stronger ties with Russia. This would involve not joining the E.U. Russians don’t want to lose Ukraine because they do not want to share resources. Disputes between Ukrainians have become so tense that in March, Crimea seceded from Ukraine to join Russia. Tuesday, March 18, Russian President Vladimir Putin signed a treaty that announced Crimea would be part of Russia. Many Ukrainian officials and the Ukrainian president criticized the treaty. They stated that it was illegal by the Ukrainian constitution for Crimea to secede. Russian officials and President Putin on the other hand stated it was legal according to the first article of the U.N. charter. Military actions have been taken to keep Crimea part of Russia. The same day the treaty was signed, 2,000 Russian soldiers took over Ukrainian military bases in Crimea. They also set a time limit for when all Ukrainian soldiers should leave Crimea. U.S. Vice President, Joe Biden, met with the presidents of Poland, Latvia, Estonia, and Lithuania, all of which are part of the European Union. He spoke about Russia’s increase in military spending over the last eight years and how the Baltic region should support pro-Ukraine. These Baltic countries and many others are worried if Putin may attempt to take over their countries too. Now the E.U. and President Obama have enforced an asset freeze, (a legal process in which those suspected guilty are denied the ability to touch their money that is being held — in this case held in the E.U or U.S) on over a dozen people who are Ukrainians and Russians that were involved in Crimea’s secession. The situation is still pending, with newspapers, TV and other media outlets constantly updating the world on what might happen next.